← Population along the National Park Kahuzi-Biega prove their involvement in the governance of natural resources of this site. 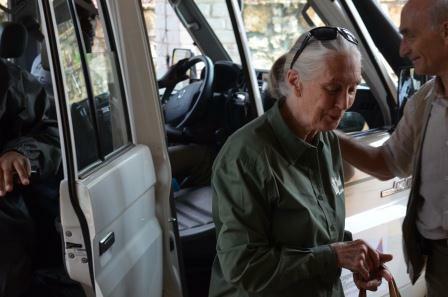 The Ambassador of chimpanzees Dr. Jane Goodall, founder of the Jane Goodall Institute, was positively surprised by conservation efforts in National Park Kahuzi Biega. 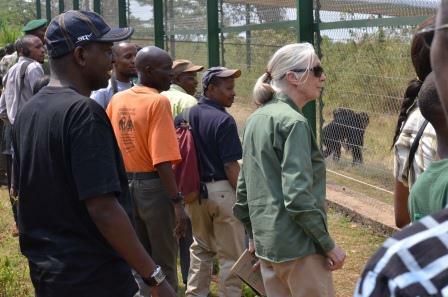 After two unsuccessful attempts to visit the eastern Democratic Republic of Congo, Jane Goodall has finally landed in eastern Congo where she had the opportunity to visit the Centre for Rehabilitation of Primates Lwiro (CRPL), a sanctuary of Primates managed by ICCN in collaboration with the Spanish NGO COOPERA.This sanctuary is supposed to be the first in Africa through its current infrastructure which hosts 12 cercopithecus hamlini, one cercopithecuse Allen, 14 cercopithecus ascanius 14 baboons, 13 small chimpanzee and 35 chimpanzee including 20 females and 15 males survivor of poaching that has occurred during war in eastern RDC. gorillas, chimpanzees and other animals. Now that you honor me with the medal and many other gifts as a memorial and souvenir while I was visiting PNKB,I will come back. Jane Goodall. “She added that she is not the hero, heroes are Eco guards who scarify their lives for the lives of these primates.Those who believe that the Kahuzi-Biega National Park is not worth visiting, should live experience of Jane Goodall: Come, see and judge later. Kahuzi-Biega National Park is and remains of a great interest still; this presence of the ambassador is a great proof. 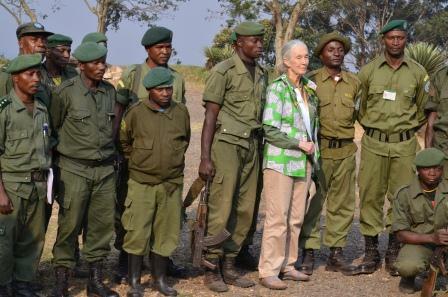 This entry was posted in DR. JANE GODALL HONORS NATIONAL PARK OF KAHUZI BIEGA by HIS VISITING, Echo of the environment at South Kivu and tagged climate, dr jane goodall, environment, jane goodall, jane goodall institute, science. Bookmark the permalink.